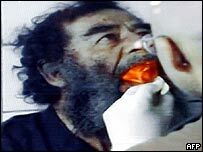 As a colleague pointed out, these pictures of Saddam’s medical examination make Iraq’s former dictator look like, well, the Balrog. Which raises the question: Why have we not sent Gandalf to Iraq??? Um, yes, so December 17 is one day away.